Star Wars: The Force Awakens picks up three decades after we had left Luke, Leia, Han, and the gang celebrating the victory of the Rebel Alliance in Return of the Jedi. After the generally poorly received prequel trilogy, the auteurs helming this “sequel trilogy” knew that they had to give Star Wars fans what they wanted: namely more of Luke, Leia, and Han and absolutely no Jar Jar Binks. Thus, Star Wars: The Force Awakens was released to great fanfare, kickstarting the latest chapter in the Star Wars saga and bringing back original cast members Mark Hamill, Carrie Fisher, and Harrison Ford for an energetic installment that pays homage to its origins. The film finds Han Solo having to the cynical smuggler he was when we first met him in A New Hope, albeit considerably older and less dismissive of the Force. Although Ford made it clear in pre-release interviews that “Han does not aspire to the position of Obi-Wan,” he essentially serves a similar role, connecting new characters with old stories and legends through his wizened recollections. “I tried to make him look as I thought Han would have evolved,” Kaplan elaborated to Entertainment Weekly. Indeed, The Force Awakens pays tribute to the classic “Han Solo look” developed by costume designer John Mollo for A New Hope and The Empire Strikes Back in the 1970s. 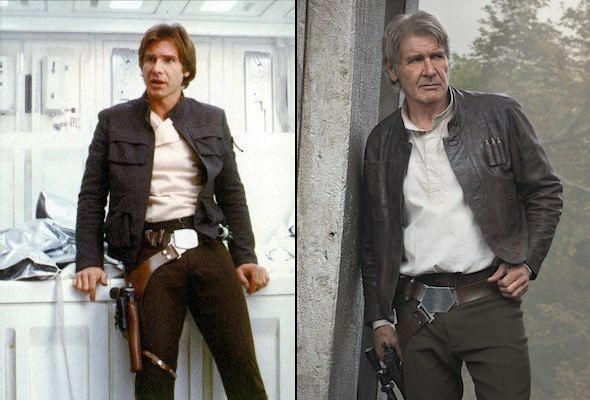 Left: Harrison Ford in The Empire Strikes Back (1980), sporting Han’s iconic “Bespin outfit”. Right: Ford in Michael Kaplan’s “evolved” costume in Star Wars: The Force Awakens (2015). “Same jacket,” Leia notes upon their reunion on D’Qar. “No, new jacket,” Han insists, and it’s certainly new to viewers… though the idea of Harrison Ford as an adventurer in a brown leather jacket is anything but! 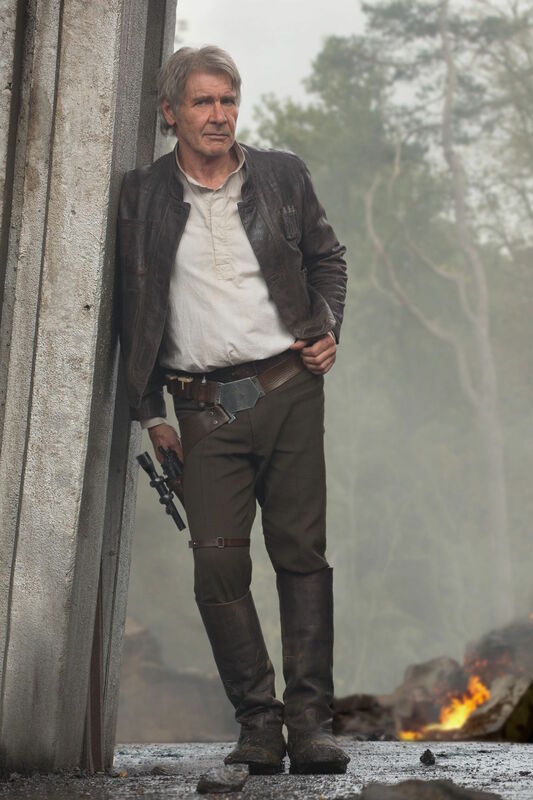 Han Solo had previously worn a jacket in The Empire Strikes Back, so this outfit continues that tradition by dressing the smuggler in a brown leather jacket that’s as time-worn as the character himself by this point in the saga. Welcome back to the Millennium Falcon, Han. The distressed leather jacket is waist-length with a standing collar and a unique front closure that appears to be magnetized with three rectangular cells evenly spaced out down the extended front tab. The cells at the collar and mid-chest are small horizontal rectangles, while the bottom cell is larger and more vertically inclined. The set-in sleeves have plain cuffs at the ends with no hooks, tabs, or loops getting in the way as Han reaches for his blaster. Apropos his smuggling profession, the jacket is covered in pockets and other storage solutions, including hip pockets with straight openings on each side, a top-opening patch pocket on the right breast, and a small top-opening patch pocket at mid-chest on the left side. On the jacket’s upper left breast are three vertical slots where Han keeps three silver-toned cylinders, though I don’t believe their purposes is ever explained (on screen, at least; they are described as “detonator casings” in the description of Anovos’ replica jacket. Replicas of Han’s new jacket have been all over the place even before The Force Awakens was released, including a few on Amazon ranging in quality for this synthetic “leather” version for less than $60 to a somewhat better reviewed leather version priced around $160. (All prices as of May 2018.) Replicas like these tend to be better suited for cosplay or Halloween costumes rather than more substantial wear, though the “nerf-hide” jacket that will be available this spring from Anovos for $500 looks promising for those looking to make their daily attire a little more “scruffy-looking”. If you want the real thing, you’d have to cough up a good bit more than three figures. After production wrapped on The Force Awakens, Harrison Ford’s screen-worn jacket was auctioned for $191,000 to raise money for epilepsy treatment and research, a cause chosen by Ford in honor of his daughter Georgia. You can read more about the auction here. Han’s shirt also echoes his attire in the earlier films. The material appears to be an off-white cotton in a long-sleeved pullover style that shares more similarities to the simple beige v-neck shirt he wore in A New Hope rather than the double-breasted pullover tunic of the subsequent two movies. The shirt has a soft standing collar, similar to a tall Mandarin collar not meant to be fastened in place, with a fly placket similar to a henley shirt without buttons. Rey (Daisy Ridley) considers her reluctantly offered job to be Han Solo’s mate on the Millennium Falcon. Another substantial change was to Han’s cavalry-style trousers with the removal of the iconic “Corellian bloodstripe” down each side. Instead, these flat front trousers are a solid brown in a shade with a twinge of olive that contrasts with the jacket, boots, and belts. The trousers themselves are held up with a brown leather belt with a squared dark steel single-prong buckle. Rey practices aiming the blaster offered to her by Han as BB-8 lurks in the background. In addition to his trouser belt, Han is never seen without his utility belt and gun rig. The design is more or less the same as we saw in the original trilogy with a wide hexagonal modular buckle in gunmetal on the front and back that attaches his DL-44 blaster to a holster fastened to his right thigh, secured in place with a smaller strap just above his right knee. The utility belt has cartridge holders on the right side and a small leather pouch on the left side. Evidently, Takodana is no place to venture unless one is well-armed. Han wears a pair of well-worn brown pebbled leather equestrian-style boots that rise to just below his knees. A pair of very affordable Funtasma boots have been identified on Amazon as a cosmetic replica for Han’s boots, though the reviews seem to indicate “you get what you pay for” levels of quality. BB-8 lurks behind Han on the Millennium Falcon. On the snowy Starkiller Base, Han supplements his look with a heavy dark navy hooded parka with the same triple-loop cartridge holders on the upper left chest as he has on his leather jacket. The parka has taupe fur lining around the neck, set-in sleeves, and black latches that close the jacket down the front. Han completes his cold-weather look at the Starkiller Base with a beige scarf, tied in an over-hand knot. 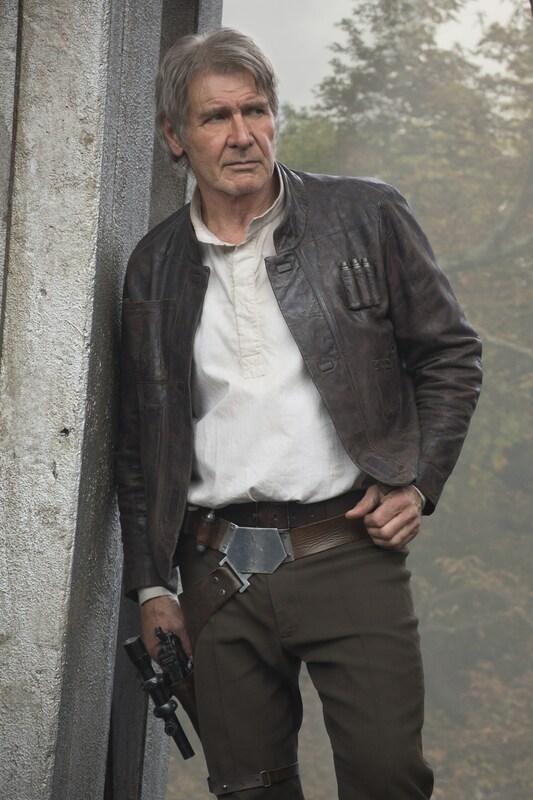 Star Wars: The Force Awakens dresses Han Solo in a natural evolution of his classic look, anchored by a brown leather jacket that adds a touch of Indiana Jones to this Harrison Ford character. With only some adjustments here and there, this very utilitarian outfit could translate well among your everyday attire in our more accessible galaxy. Han Solo has always remained a staunch advocate of “a good blaster at your side,” and The Force Awakens finds him armed with the same “BlasTech DL-44” heavy plastic pistol that he carried in the original trilogy. The design was originally inspired by the Mauser C96 semi-automatic pistol developed for the German military around the turn of the 20th century. The “broomhandle” Mauser’s unique look made it a mainstay of movies and TV shows including The Man from U.N.C.L.E., Joe Kidd, Three Days of the Condor, and the James Bond franchise before three modified props were created by Elstree Props and/or Bapty & Co. for the original Star Wars trilogy. Han with his DL-44 blaster… both in battle and preparing for it. The site goes on to describe that “bowcasters are more powerful and accurate than blasters, firing a metal quarrel encased in plasma energy,” something that Han Solo discovers to his own delight when he borrows the weapon during the Battle of Takodana. Unlike the other firearm-based weapons of the Star Wars universe, Chewie’s bowcaster is based on a traditional crossbow… though it’s naturally meant to fire lasers rather than bolts. As you can read in this forum, internet detectives have narrowed down the original basis for Chewie’s weapon to likely be a skeleton-stocked crossbow made by the SinglePoint company in the U.K. Check out the movie as well as the original trilogy, to which this installment pays dutiful homage. This was one of those moments that made it worth seeing the movie in theaters as the audience erupted in applause and cheers.